Select Length 4 ft. 6 ft. 8 ft. 10 ft. 15 ft. Manufactured from heavy duty 1.75" flat webbing (Tensile Strength: 6,000 lbf.) 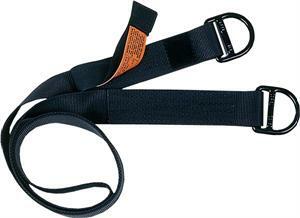 Each sling has a "D" ring (proof load: 5,000 lbf.) sewn to each end to provide maximum versatility. Anchor points may be wrapped single, double, and triple to suit particular rescue situations. When looped like a basket hitch, anchor slings meet General Use load requirements. Although webbing tensile strength is high, overall tensile strength is limited by the "D" rings.